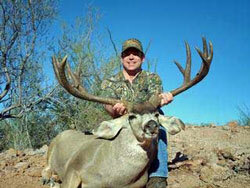 Marks lifetime dream came true when he took this trophy Mule Deer on a hunt in Sonora Mexico. We understand designing a custom gun is very personal, and we are providing the information here as a starting point for our discussion on building the best rifle customized to your specific needs and desires. And this discussion will continue (by phone, email, fax, whatever is appropriate) until we have complete agreement on the details of YOUR new rifle! So explore, and when you are ready, let's talk. When Chet Brown pioneered the concept of a fiberglass rifle stock in the early '60s, he had little idea of the impact his new creation would have on the direction of the firearms industry a quarter of a century later. Read the whole story including Brown's extensive industry firsts! A small, family-owned US manufacturer for over four decades, our focus has always been on building the best guns possible for the individual hunter, or for the military and law enforcement community – we've always felt very strongly we should provide the best support possible to the people who help us in so many ways. As we proceed through the twenty first century, it is easy to see all of the high tech advancements in our world today. … These are particularly evident in the gun industry. A majority of the production rifles available today utilize synthetic stocks and many are using specialized materials such as stainless steel." Read Mark's complete message and his "How I Build a Rifle for Myself" article. We believe informed consumers make better decisions … so throughout this site you will see references to our Glossary. If you see a term that you don't recognize, or one we didn't include, please email us for future inclusion. We are always updating our FAQ's (Frequently Asked Questions); if you have a question we didn't answer, please email us so we may consider it's addition in future updates. We've had a long term interest in today's young shooters… after all we used to be kids, and we've had young shooters of our own. If you have an interest in a rifle for a younger shooter, check out our Custom High Country Youth Rifle page, and then give us a call. We never expect our site to be truly "finished", since we are constantly adding new products and services. We invite you to return often to see our progress. We're actually in the middle of a major update now – so if something doesn't look right, or a link goes awry, let the webmaster know. Thanks.